Site Selection Magazine wrote a great piece this week on the tremendous success of the InTech center, and how the training partnership between California Steel and Chaffey College in Riverside is literaly re-writing how apprenticeships can provide both aligned talent to local manufacturers and rewarding opportunites to students. See below and hit the link for full article on Site Selection Magazine. San Bernardino County companies and institutions show the rest of the world how a regional approach works best for upskilling and growing the workforce. The Industrial Technical Learning Center (InTech) at Chaffey College in Fontana, California, is the kind of place where individual dreams and company goals can both be realized. Launched in 2014 with a $14.9-million TAACCCT [Trade Adjustment Assistance Community College and Career Training] grant, and with backing from companies and the region's 12 community colleges, the center is blazing new trails. 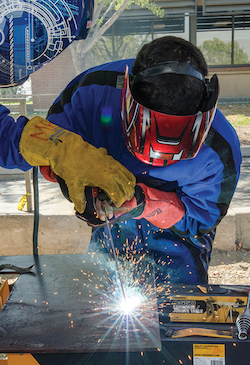 "The InTech partnership between California Steel and Chaffey College is an exemplary Apprenticeship model that aligns academic learning with hands-on, practical on-the-job learning," says Gino DiCaro, vice president of communications for the California Manufacturers & Technology Association. "Employers and community colleges up and down the state can learn from this highly successful apprenticeship program." They can, and they should. "The U.S manufacturing sector is advancing rapidly, and the pathways to developing and acquiring talent must change to keep pace," DiCaro says. "Secondary education must reflect current employment needs by offering a wider variety of training options for career choices, including apprenticeships that take the place of typical school programs for technical-style work."